Random House Children's Knopf's Book for Young Readers and Net Galley allowed me to read this book for review (thank you). It will be published June 7th. This is a dark fantasy novel about a girl and her brother and her boyfriend who all live with an older lady who provides room and board. At the moment, they are living by theft. They don't need a lot of money but they'd like more. When the money is good, Julia takes on an assumed name and goes to work in a very strange household. The time they live in is turbulent. 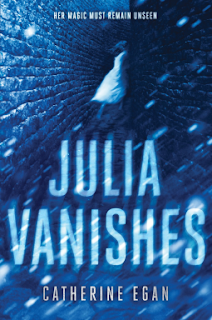 They drown witches (and call it cleansing), there are bits of magic about, and Julia can't demonstrate her talents without facing drowning. She's secretive about it but it doesn't work with everyone. The woman who owns the house can see her! That woman has her own secrets. One man is trying to put a magic book back together again. He's stolen a tree from the yard of the house she's working in and now she's stolen the little boy for him. She decides she must steal him back because she can't live with the guilt and she's managed to fall in love with the little tyke.